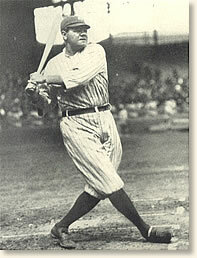 He was called the Home Run King, the Babe, the Sultan of Swat, the Colossus of Clout and the Bambino. He was the most acclaimed and highest paid baseball player of his day. His uncanny ability to bat a baseball out of the park created a legend and transformed the New York Yankees into a premier baseball club. A Pulitzer-winning photo by Nathaniel Fein. Born in Baltimore, Maryland in 1895, the Babe had a troubled youth highlighted by his consignment to the St. Mary�s Industrial School (a reform school in downtown Baltimore) by his parents when he was seven. He was a troublesome child who seemed to only find contentment on the baseball diamond. The priests at his school nurtured his talent and convinced the owner of the Baltimore Orioles to give him a chance in 1914. That same season he was traded to the Boston Red Socks as a pitcher. Ruth's ability at bat was soon revealed. The Red Socks converted him from a pitcher to an outfielder in 1919 to assure he would be in the lineup for every game. The move paid off, that year he hit a record twenty-nine home runs. He was traded to the Yankees in 1920 and hit fifty-four homers for the season. He topped this the following year by smashing fifty-nine baseballs out of the park. At the time, the Yankees played their games in the rented Polo Grounds. The money generated by the crowds clamoring to see Ruth allowed the Yankees to construct their own stadium in the Bronx � Yankee Stadium, "the house that Ruth built." "I knew I was going to hit it. 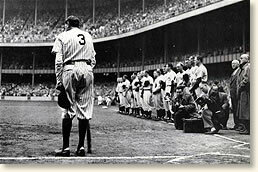 . . "
"The pennant race was over by September, but Babe was fighting to break his 59 home-run record. He needed 17 to do it in the last month, or better than one every two days. He did it of course. The 60th was made in Yankee Stadium against Washington. Tom Zachary, a left-hander, was the pitcher, and the homer came in the final game. The Babe had smashed out two home runs the day before to bring his total to 59 for the season, or the exact equal of his 1921 record. He had only this game to set a new record. Zachary, a left-hander, was by the nature of his delivery a hard man for the Babe to hit. In fact, the Babe got only two homers in all his life against Tom. Babe came up in the eighth inning and it was quite probable that this would be his very last chance to break his own record. My mother and I were at the game and I can still see that lovely, lovely home run. It was a tremendous poke, deep into the stands. There was never any doubt that it was going over the fence. But the question was, would it be fair? It was fair by only six glorious inches! The Babe later professed himself to be unimpressed and unexcited and certainly not surprised by the blow. 'I knew I was going to hit it,' he insisted. I didn't, although I was now used to his riding to occasions. What delighted him as much, more than the homer, was the spectacle of his pal, Charlie O'Leary, jumping and screaming on the coaching lines, his bald head glinting in the falling sun. Charlie had thrown away his cap in jubilation when the umps signaled the ball fair. Babe knew the extent of Charlie�s joy because he knew his little friend was almost psychopathic about his bald dome. They didn't play the 'Star-Spangled Banner' before every game then, only on festive occasions. On these occasions Charlie would hide. The baring of Charlie's gleaming head was an appreciated tribute to the popularity of that historic homer." This eyewitness account appears in: Ruth, Babe, Mrs., with Bill Slocum, The Babe and I (1959); Creamer, Robert, Babe: the legend cones to life (1974); Smelser, Marshall, The Life that Ruth Built: a biography (1975). "Babe Ruth Hits His 60th Home Run, 1927" EyeWitness to History, www.eyewitnesstohistory.com (2009). Babe Ruth's home run record was broken during the 1961 season by Yankee outfielder Roger Maris who hit a total of 61. Clair Ruth, the author of this eyewitness account, was the Babe's second wife. They were not married at the time of this event, but were romantically involved. Ruth was estranged from his first wife, Helen, but would not contemplate divorce because of his Roman Catholic convictions. Helen died in a tragic fire in 1929. The Babe and Clair were married shortly after.